Wondering if it's the right time to break into the cryptocurrency market? That makes sense, especially since there never seems to be a clearly perfect moment. The journey cryptocurrency owners, especially ones who have been there since the beginning, have been incredibly rocky. Look at Bitcoin. It stagnated as an almost worthless investment before skyrocketing to a price of $20,000 in December of 2017. It has fallen off significantly since, but a statement was made. Cryptocurrencies were a joke just a few years ago; now, former President Bill Clinton is set to be keynote speaker at the Swell conference created by Ripple. The notion of cryptocurrency has intrigued some and turned others off, and the concept has likely baffled even more people. Some think it's the wave of the future while others dismiss it as an online fad. There's a group who believes cryptocurrency and the technology behind it can change the world for the better; there are others who see it as a dangerous trend that wastes energy. But if you're just looking to get into the cryptocurrency game, before you understand why all of that is, you need to know what it is at all. Instead of a tangible piece of currency you can take with you, a cryptocurrency is a digital asset that can be exchanged. The "crypto" part stems from the use of cryptography for security and verification purposes during transactions. In using cryptocurrency for an exchange instead of fiat currency, crypto owners don't have to rely on banks to facilitate transactions, and can successfully avoid the fees that come with using financial institutions. Generally, cryptocurrency transactions are processed and completed via a blockchain network. Blockchains are designed to be decentralized, and so every computer connected to the network must successfully confirm the transaction before it's able to be processed. Ideally this creates a safer transaction for everyone involved. It can also lead to you waiting awhile; one big complaint about Bitcoin is how long it can take for a transaction to go through. Cryptocurrency transactions are put into a "block," and the computers in the network get to work solving a complex mathematical problem. Once a computer solves it, the solution is shown to the others on the network, and if the whole network is in agreement that this solution is correct, that block is added to the chain and the transaction is completed. Multiple transactions in one block makes it harder to edit a single transaction; the network is constantly re-confirming the blockchain on its way to the latest block and will notice should a suspicious edit be made to one transaction in a block. Because cryptocurrencies must be mined, there is a finite amount of them that can exist. For example, there are 21 million bitcoins (BTC). Blockchain is a big part of what has made cryptocurrency a household name, and its versatility has led to the creation of many cryptocurrencies that are meant to disrupt industries besides banks. The decentralized nature of the network is seen as safer, and businesses - especially those with valuable assets - are interested. Some companies have merely dipped their toes in the blockchain water. Other companies, like Overstock, have completely overhauled their business model to incorporate it. There are banks interested in what blockchain can do for them, but cryptocurrencies like Bitcoin were developed expressly to avoid the use of banks altogether. Fans and developers of crypto like the idea of a decentralized network that does not require the need of any other parties to process a transaction - and as a third-party with a centralized network, a bank is not where cryptocurrency owners generally want to go with their stash. Before Bitcoin, there were a few attempts at digital currencies with similar ambitions as Bitcoin. But they were unable to reach the same heights of popularity. Both "B-money" and "Bit Gold" were prior cryptocurrency concepts that incorporated the solution of mathematical problems into the hashing of a blockchain. Bit Gold's proposal, written by Nick Szabo, also involved decentralization. The first iteration of what has since become cryptocurrency, however, is Bitcoin. And that story begins in 2009, when the entity known as Satoshi Nakamoto created and released Bitcoin into the world. Nakamoto's true identity is unknown; some believe it is one person, others believe it is a group. That same year, Bitcoin software was made public, allowing people to mine bitcoins and creating the first Bitcoin blockchain. A cryptocurrency to be mined, Bitcoin could easily be seen as a novelty in those early days. 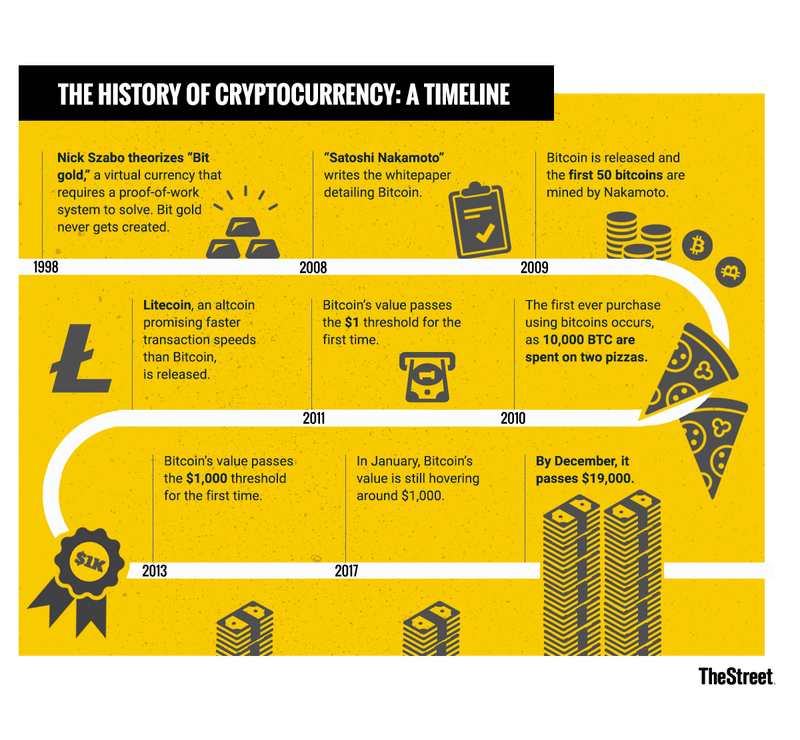 It established itself as something that could be used as actual currency for the first time in 2010, when someone successfully used 10,000 BTC to buy two pizzas. As of this writing, 10,000 BTC are currently worth more than $68 million. The increase in Bitcoin's value was slow, but as the cryptocurrency gained a passionate following, others began to pop up as well in the hopes of chasing the crypto/blockchain trend, known as altcoins. Litecoin was released in 2011; Dogecoin, a joke cryptocurrency based on a meme, was released in 2013 and currently has a market cap of more than $289 million. Bitcoin became more well-known every year, but the height of the price was limited until a surge in late 2017. It was the most volatile price year for a currency with a history of volatility; 1 BTC was worth under $1,000 dollars in mid-January but by late December had reached nearly $20,000 in value. It has, of course, fallen significantly since that height. Where Can I Find Cryptocurrency? Which one you use will depend on a number of factors. Are you able to buy your preferred cryptocurrency with fiat currency, or will you need to exchange other cryptos for it? How much time and money do you have, and how much energy are you willing to use? First, though, you'll need to decide if you want to acquire cryptocurrency by mining it or by purchasing it. Cryptocurrency mining is for the most avowed crypto-enthusiast. It's time-consuming, expensive and takes up extreme amounts of energy - some say a worryingly large amount of energy, in fact. So if you're looking to dive into cryptocurrency mining, keep your expectations realistic and understand that there's a large chance it's a losing effort. The costs of mining hardware and software, which are always updating and adapting, add up. And the aforementioned energy consumption required for mining is bound to do some real damage to your power bill. Miners will spend a lot of their time debating between powerful options and less costly options. Mining hardware such as ASIC miners offer power, but a great graphics processing unit (GPU) for your computer can also be used to mine cryptocurrency at less of a cost. What keeps people coming, though, is the knowledge that a lucky few days may help recoup some losses with newfound cryptocurrency. The computer will continually mine for cryptocurrency by solving the previously mentioned mathematical equations. Should your computer solve the proof-of-work system and successfully hash a block to the chain, you are rewarded with cryptocurrency. With so many people mining out there, one computer won't find much. So many people join mining pools to combine their computing power with others around the world. When one computer successfully mines, the reward is shared throughout the pool. To learn more about the ins and outs of Bitcoin mining by reading our article. Mining is expensive and uses an absurd amount of resources, so it's understandable if you'd want another way to get cryptocurrency. Luckily you can now purchase it in a variety of manners. The most popular and common way to buy cryptocurrency is via a cryptocurrency exchange. An exchange is a platform that allows you to trade for or purchase a cryptocurrency. Some allow you to use fiat currency like USD to buy, but for others you may need to already own some cryptocurrencies like BTC that you can exchange for another. Some exchanges exist as platforms simply to trade - ironically, these exchanges are centralized. In these cases, the exchange offers the convenience of simply buying or selling cryptocurrency and simply takes a fee. Other exchanges, peer-to-peer ones, offer the ability to put you in contact directly with the trade you are buying from. Do research not just to see what exchanges offer what, but what their reputations are; a p2p exchange with a seedy reputation may be a one-way ticket to getting scammed. To buy Bitcoin or other cryptocurrencies on an exchange is generally a fairly simple process. Exchanges like Coinbase or Coinmama allow you to purchase them with your credit or debit card. One way of acquiring cryptocurrency that has grown? An ATM. Bitcoin ATMs have popped up around several major cities where you can, in an instant, get BTC in exchange for cash. If you need more options for purchasing Bitcoin with a credit card, PayPal or cash, click here for our guide. Regardless of your method for buying cryptocurrency, you will need a wallet in order to obtain it. A cryptocurrency wallet is a public key and a private key. These digital keys confirm that it is you who is purchasing the cryptocurrency and links you to the blockchain. 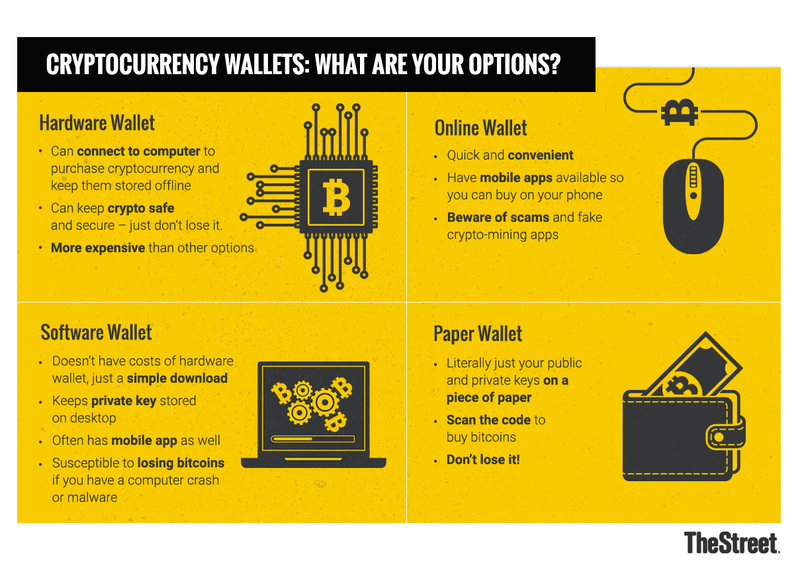 There are several types of cryptocurrency wallets to consider, though, whether those wallets support your desired crypto will be a large factor. Among the safest are hardware wallets and paper wallets. Hardware wallets can connect to a computer so you can purchase cryptocurrencies, and then be stored offline. Paper wallets are literally just your public and private keys on a piece of paper, meaning they don't connect online at all. Hardware wallets can be expensive, though. Software wallets don't come with the same costs, but run into more security risks, like getting hacked or a computer crash. Still, a reputable software wallet running on a computer with effective anti-virus and anti-malware protection should be able to safely store your cryptocurrency. Often, software and online wallets also have a mobile app available for iOS and Android. Check out our list of some of the top Bitcoin wallets available. What exactly can cryptocurrency do once you have it? It's a debate that has raged on since Bitcoin first burst onto the scene. "Currency" is in the name, and yet it took a year for anyone to make a single purchase with it. What kind of "cryptocurrency" is limited in its ability to be actually used as currency? The number of things one can purchase with cryptocurrency has grown, but it is also not the only way one can use it. Investing is a popular tool for cryptocurrency lovers now as well. Investing in cryptocurrency is arguably easier than spending it. What you do is buy some cryptocurrency. Then you... keep it. That's it. The volatility inherent in cryptocurrency, an intangible entity that still has a lot of mystery to it, has made it an intriguing investment for those who want a risk in their portfolio. And what says risk more than buying something that hit nearly $20,000 in value only to erode to below half of that the next year? Cryptocurrency investments, if you're truly passionate that it will work out, can be extremely long term. Think of someone who purchased bitcoins in the beginning of 2011, when their value was below a dollar, and how they must have felt if they still had them in December 2017. They weathered quite a few storms in between before it was worth it, and that sudden spike was far from certain. Then again, think of someone who bought some bitcoins around the time it spiked, only to watch its value continually decrease throughout the next year. Cryptocurrency investments are a major risk, and those looking to do it should give the idea the full thought it requires. Because of this, many look to try other methods of investing in cryptocurrency. Most often, that can be done via investing in companies that work on blockchain-related technology. Nvidia (NVDA - Get Report) and AMD (AMD - Get Report) each create powerful GPUs that many use to help mine cryptocurrency, and their efforts to keep up with the power necessary for mining has made Nvidia in particular a big stock in 2018. A company like Overstock (OSTK - Get Report) , which accepts Bitcoin and has developed its own blockchain, is also a popular crpyto-adjacent investment choice. Read our guide on investment advice for Bitcoin if you want to learn more. Can You Buy Things With Cryptocurrency? Bitcoin as a currency has come a long way since the days of someone assuming 10,000 BTC would be sufficient for 2 pizzas, even if it's nowhere near the mainstream currency its owners want it to be. Several different retail and online outlets have made room for those looking to use cryptocurrency for purchases - at least, the cryptocurrencies made with the intention of being used as payment. The aforementioned Overstock, as well as electronics outlet Newegg, accepts Bitcoin payments for the various items available for purchase, and travel site Expedia allow users to use BTC for certain hotel bookings. There is also a pizza site specifically designed for buying pizza with cryptocurrency called PizzaForCoins.com. Websites are able to do this with the help of businesses like ShapeShift, a crypto-trading platform that helps PizzaForCoins accept over 50 different cryptocurrencies as payment. Online platforms are inherently easier for accepting cryptocurrency, but some stores in the outside world have attempted crypto purchases, including some KFCs and Subways around the world. And Starbucks' latest partnership with Intercontinental Exchange Inc., which recently launched a cryptocurrency integration system called Bakkt, has people wondering if the ability to buy Starbucks with bitcoins is right around the corner. Learn more about where you can use Bitcoin for buying goods in our handy guide. With all the risks mentioned about Bitcoin, it would be understandable if you perhaps did not want to get involved with it. If you're still interested in cryptocurrency, however, what are other popular ones you may look into instead? Here are some of the more notable altcoins on the market - both in terms of notoriety and market cap. Ethereum. Ethereum is currently second only to Bitcoin in terms of market cap. What makes Ethereum (and its specific cryptocurrency Ether) stand out from Bitcoin is that instead of working as a currency and disruption for banking, Ethereum attempts to disrupt online data storage. The blockchain on Ethereum is popular for storing smart contracts. Ripple. In stark contrast to Bitcoin's intention to be separate from banking, Ripple and its XRP currency attempt to help financial institutions. XRP's strength as a currency is its ability to be used in the middle of a transaction between two different fiat currencies, minimizing liquidity. Ripple is not mined, and the 100 billion XRP created simply exist. Ripple also promotes itself as having a significantly faster transaction speed than Bitcoin. Litecoin. Litecoin has also frequently flaunted its transaction speed in comparison to Bitcoin, and as a result is seen by some cryptocurrency fans as another potential altcoin that can become a legitimate currency. Helen's Pizza, a restaurant in Jersey City, NJ that accepts Bitcoin payments, also recently announced it would accept Litecoin as well. Zcash. Zcash is also meant to be used as currency, but for private transactions. Blockchain transactions for cryptocurrency are usually visible on a public ledger, but Zcash allows businesses and other entities making transactions to selectively show their data on the ledger while hiding certain details. Yes, the United States Internal Revenue Service says that virtual currency transactions are taxable. Cryptocurrency you are holding onto as a capital asset is treated as property; as such, buying some crypto and then merely holding it and not doing anything means it can be treated as a stock or a bond and not necessarily reported. If you sell some or exchange some to buy something, though, you will need to report that. If you are paid via cryptocurrency, that is taxed as income and must be incorporated into your income on your W-2. Employers paying in crypto must also make sure it is in their W-2, and keep spotless records of what the cryptocurrency was worth in USD on the day the transaction was made. 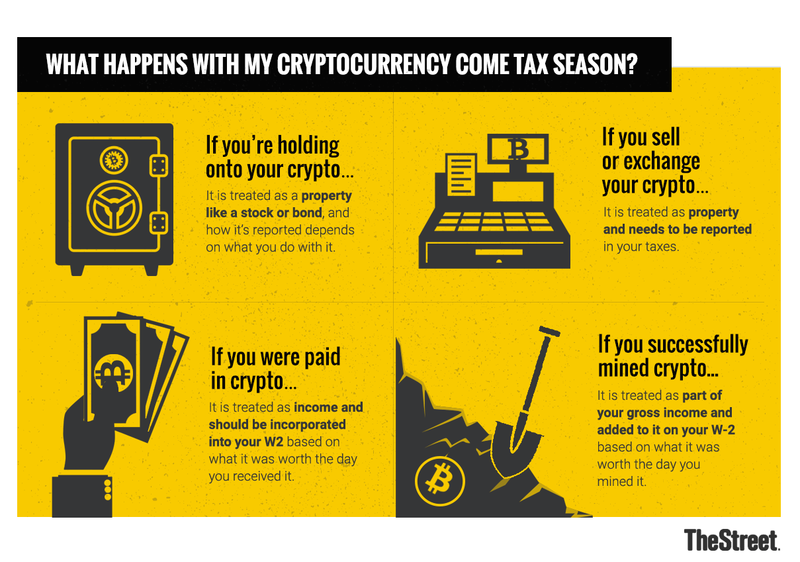 If you're a crypto miner and successfully mine coins, the IRS claims you will need to report that on your W-2 as well as part of your gross income. Like with cryptocurrency payments, you should keep records of what your coin rewards were worth when you received them. Though cryptocurrency has found its way into mainstream discussion, major skepticism remains. Many worry that crypto, Bitcoin in particular, will turn out to be a bubble that will soon burst. In addition, Bitcoin has seen its fair share of scams. Blockchain and cryptocurrency-related companies will often have an initial coin offering (ICO) instead of an IPO, requesting cryptocurrency in exchange for your company's cryptocurrency in order to help the value. However, this is extremely risky, and fake ones are common. Perhaps the most controversial element of cryptocurrency, however, is the energy. The proof-of-work process needed to mine bitcoins consumes a concerning amount of electricity, and the concern has grown as more and more people have taken up mining. This is much bigger than power bills; according to Ars Technica, the annual rate of energy consumption from Bitcoin is the same as the rate for all of Denmark. This is a major environmental issue. Some cryptocurrencies have instead attempted to use a proof-of-stake method, where nodes are validated in deterministic fashion, to help with this energy crisis. Instead of mining a block, the creator of the block is determined by how much wealth they have within the cryptocurrency and the stake they put in. There is no reward, so they instead receive the transaction fee. Most importantly, this doesn't require any expensive equipment taking up power. However, the overwhelming majority of cryptocurrencies still use proof-of-work. As mentioned, there are scams to be wary of. Cryptocurrency is still a relatively new thing that many frequently misunderstand, and it's easy to rip someone off. So can cryptocurrency be safe? If you're careful, cautious and make the right choices, yes. Doing cold storage (keeping your wallet offline via a paper wallet or unplugged hardware wallet) can keep your cryptocurrency offline. Keep your computer updated and protected. Do as much research as you possibly can before deciding on a cryptocurrency and the exchange you purchase it from. Yes. It's something cryptocurrency owners need to be wary of, and why so many choose to store them offline as soon as they purchase any digital coins. The most notable form of cryptocurrency hacks is hacking a cryptocurrency exchange. Once a bitcoin is gone, it's gone forever. That exchange no longer has it, and cannot recover it. This year, South Korean exchange Coinrail was hacked and may have lost as much as $40 million worth of coins. It's hardly the first instance of a hacked exchange. Japanese exchange Coincheck lost over $500 million in a hack. And the Mt. Gox exchange went through multiple hacks that cost them hundreds of millions of dollars in cryptocurrency; eventually, they had to shut down.